Upgrade your garage or shop with the self-storing ease and extreme performance of the TEKTON 50 ft. x 3/8 in. I.D. 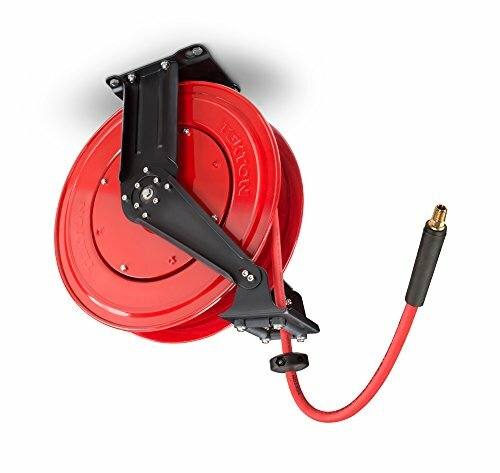 Dual Arm Auto Rewind Air Hose Reel. Pull out the length of hose you need and it locks in place, so there's no backward tension while you work. Tug to release the hose and it rewinds neatly into storage, out of the way and ready for the next job. Made in the U.S.A., the premium flexible rubber air hose stays soft and easy to work with, even at 40 degrees F below zero, yet still takes the heat up to 190 degrees F without swelling or bubbling. Strong and sturdy, the dual-arm, full-frame design is made of heavy-gauge steel that resists twisting or bending under strain so it will deliver years of dependable, maintenance-free service. CALIFORNIA WARNING: This product contains chemicals, including lead, known to the State of California to cause cancer, birth defects or other reproductive harm. Please wash your hands after use.